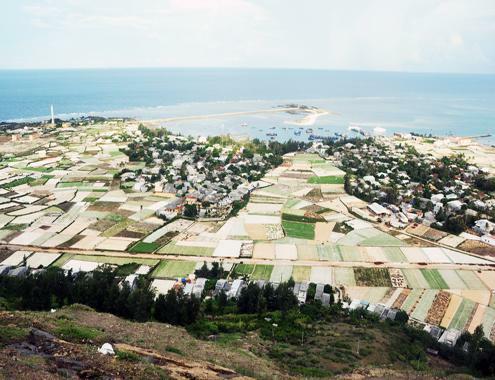 The authorities of Quang Ngai Province have decided to hire Singaporean experts to develop a construction plan for Ly Son island district, aiming to turn the island into a civilized town with an accompanying ecological marine environment. Quang Ngai’s Deputy Party Secretary, Tran Van Minh, said the houses on the islands must be designed to be strong enough to resist harsh weather and have special features of Ly Son Island. Tran Bac Ha, Chair of the Board of Directors of the Bank for Investment and Development of Vietnam (BIDV), has given VND10 billion ($500,000) to Quang Ngai to hire Singaporean experts and will support the island in human-resource training and donate medical equipment to the district. The Governor of the State Bank of Vietnam, Nguyen Van Binh, has also given VND10 billion to help poor people on the island build standard toilets and 10 public toilets near tourist attractions. Quang Ngai authorities have also delivered 5,000 free plastic baskets to local residents and has encouraged students to help make paper bags that will be distributed to local people to replace plastic bags, in an aim to reduce pollution. The province’s government has chosen to plant throughout the island square almond trees that can withstand hurricanes and strong winds, and has asked scientists to find other suitable varieties that can improve coverage and maintain groundwater resources for the island. Minh disclosed that Quang Ngai wants to reopen the Ly Son Island Airport to serve ATR 72 aircraft and offer ferry services for tourists. The province has also invited Saigontourist to build hotels and resorts with luxury services on the island. In the future, An Binh Commune on the Be (Little) Island will be developed into an entertainment center with a casino to attract domestic and international tourists. Ly Son island district covers approximately 9.97 km² of land, on two off-shore volcanic islands in the East Sea, and a few islets. The main island, Lu Son has three prominent craters, the largest of which is Mount Thoi Loi.